Inside our body, millions and millions of cells are working hard for us. However, the world is a dangerous place, and our cells constantly face dangers. A Red Blood Cell (AE3803), erythrocyte, just started her job, she is on her way to start her deliveries, such as oxygen, carbon dioxide and different nutrients all over the body. One day, as Red Blood Cell is making her routine deliveries, she becomes the target of a Pneumococcus Bacterium that suddenly invades the body. Fortunately, for her, she is saved by White Blood Cell (U-1146), neutrophil, who battles relentlessly against the invaders. Somehow, one Pneumococcus is able to escape and now is on the run, searching for a way to infect the whole body. The White Blood Cell’s job is to protect the body and begins to hunt it. At the same time, Red Blood Cell has her own problems finding her destination in the lung area. She is clumsy and gets lost in her way, however, she is also determined to perform to the best of her ability. Once again, she faces the Pneumococcus, and somehow, she is able to reunite with the same White Blood Cell. Together, they keep their search for the uninvited guest. Finally, Red Blood Cell is able to find her way into the lungs, but she is not alone, the Pneumococcus appears once again, trying to infect the system. Once more, White Blood Cell makes a heroic appearance and fools the Pneumococcus to follow them into an enclosed area, where mucus is formed. That way, they are able to contain him, and eject him out of the body. 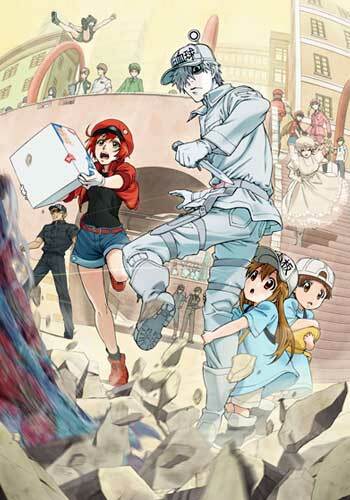 Also known as Cells at Work!, is a manga series written and illustrated by Akane Shimizu. It was serialized in Kodansha’s Monthly Shounen Sirius magazine. An anime series adaptation by David Production debuted on July 8, 2018.